Paris is called "the City of Lights" for good reason. ​People come from all over the world to see its twinkling lights and enjoy its man-made beauty. In this way, Paris unknowingly reflects its true Maker--God created light and beauty, and people show that they've been stamped with the image of their Creator by doing the same. Paris is a city to love and delight in because its every archway and avenue demonstrates something of God's grace and creative genius on display in mankind. A City of Light and Love to which the nations will gladly come is not an original Parisian idea--​it's God's idea. But now just imagine . . .
What if Paris displayed the glory of God in an even more obvious and compelling way? What if every picturesque apartment block and every side-street café were littered with Communities of Light bearing witness to the life and light they've found in Jesus? Imagine if no Parisian could avoid encountering these small gatherings of joyful Christians, whose shared struggles and shared life powerfully testified to the truthfulness of the gospel. What if the City of Lights became known the world over for its Communities of Light? The City today is a long way off from this vision becoming a reality. Paris is the most populated urban area in the European Union, encompassing roughly twelve million people. Of these twelve million, less than five percent are involved in a church of any kind (and sadly the vast majority are in churches where you're more likely to venerate the saints than encounter the good news about Jesus). The gospel need in Paris, therefore, is incredibly immense. But the answer for the need is also incredibly clear--Paris needs a church-planting movement which litters the city with attractive and authentic clusters of Christians whose shared life puts on display how good it is to live under the gracious reign of King Jesus. Emmanuel International Church, Rueil (to the west of Paris) has long desired to play a small part in this bigger vision. As an English-speaking congregation of immigrants from over 30 nations, the church understands that it has a unique opportunity (as well as responsibility!) to reach the nations flooding into Paris. Approximately, one-in-five Parisians today are first generation immigrants, and one-in-four Parisians are either fluent or native English-speakers. This all adds up to a natural and "modest" mission field between three and four million people! We are by no means alone (or perhaps even the most fruitful) in reaching the large and diverse English-speaking population of Paris. We're thankful that there are others laboring in this field as well. But when you compare the need to the number of gospel partners, the workers at present feel like so few. For some perspective, imagine a population somewhere between that of Mississippi and Alabama (or between Mongolia and Ireland) for which there are less than ten churches. Less than ten English-language churches for 3-4 million English speakers! And the handful of Anglophone churches that do exist are all over the spectrum of Protestantism, with only a minority still maintaining a commitment to the authority of the Bible. Jesus taught us not to despise small beginnings. His Kingdom is like the smallest of seeds that grows to be the most dominant plant in the garden (Matthew 13:31-32). What we long to see happen in Paris will take many churches sowing seeds and partnering together in order to see new congregations spring up all over the city. The harvest is plentiful; it's the working partners who seem so few compared to the size of the task. We're grateful, however, that God is answering our prayers and growing the number of partners engaged in this work. At the close of 2017, God brought to EIC its first Church-Planting Missionaries in K.J. and Lynn Pugh. After three years leading a church plant in the North of England, the Pughs come to Paris with a passion for growing new churches to the point of reproducing. They've come on faith and have seen God provide again and again for them on this journey (if you want to be a part of God's provision, please check out our Partner Page). New church plants in France will likely always need outside partners to help them at the start, but our hope is that in Paris these new churches can grow to the point of self-sustaining and reproducing more quickly than other places in France. One of the most difficult problems for church planting in Paris is finding (affordable) places where large groups of people can meet together. Here is where God has been providing by connecting us with like-minded French churches. 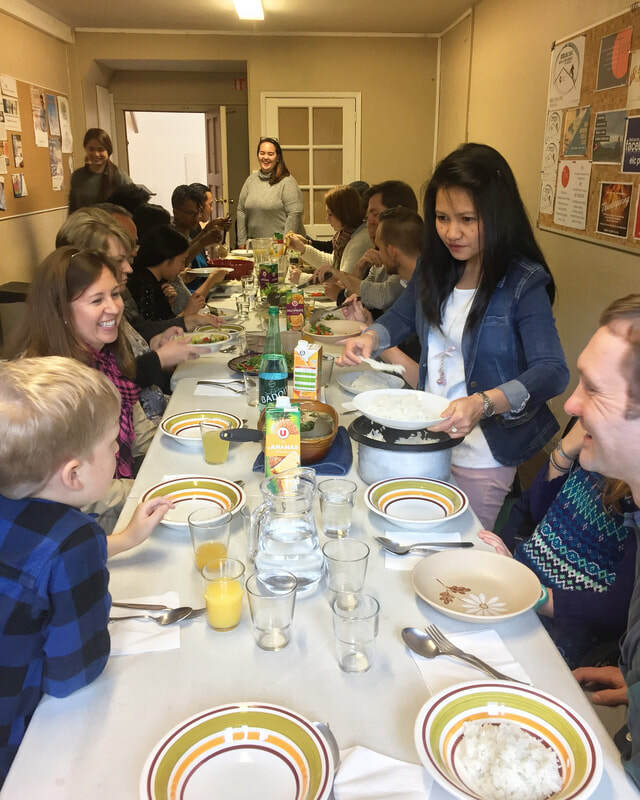 l’Église Protestante Evangeliquie des Ternes, a French-language church not far from the Arc de Triomphe, has shown great kingdom-mindedness in volunteering to host our first church plant. Our hope is that we might be a blessing and a support to them and to many other French congregations as we pursue a vision to plant English-speaking congregations throughout the city. We're constantly on the lookout for Bible-believing French churches with whom we can partner. 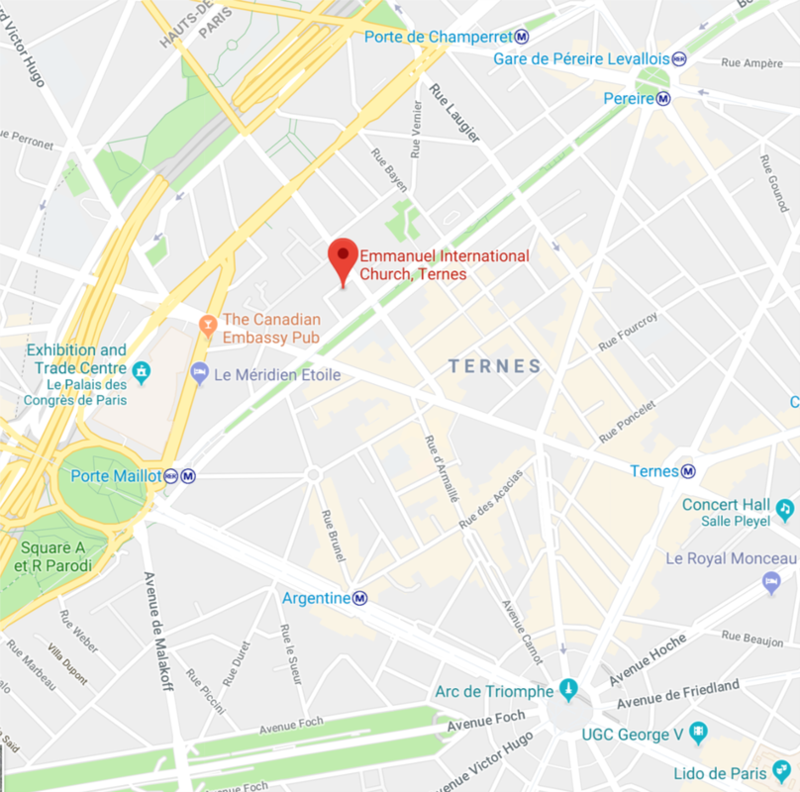 ​Emmanuel International Church, Ternes is our first church plant into the city of Paris. 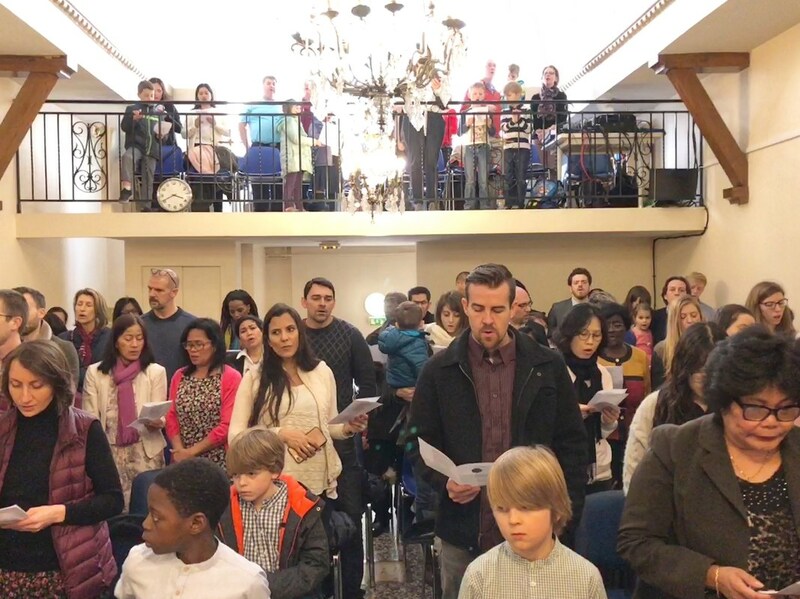 The new church officially launched Easter Sunday 2018, with nearly 100 people of all ages and a host of nationalities attending its inaugural service. It's early days still, but we're very hopeful about the near-term success and long-term future of EIC Ternes. God has blessed us with a better start than anyone knew to expect. Our prayer is that it's just the first of many new church launches God will grace us to see. EIC Ternes has been blessed in its birth by a growing support system of gospel partners. Of course, there is l’Église Protestante Evangeliquie des Ternes giving the church a place in the city to meet. Another significant partner is the International Baptist Convention, providing some crucial startup funding and coaching support. Other IBC churches in Europe as well as SBC churches in the USA are also provided vital financial and prayer support for the church planting work here. We're also blessed to have a number of individuals wanting to make eternal investments in new churches getting started in Paris. But more gospel partners are needed! Check out our Partner Page to see how you can play a part in littering Paris with Communities of Light. If you'd like to see all the research and thought that has gone into planting our first church plant in Ternes, you can DOWNLOAD HERE the full Church Planting Prospectus. Furthermore, you can DOWNLOAD HERE studies for other church-planting projects that Plant Paris would like to undertake as God provides help from partners like you. Easter Sunday Launch of EIC Ternes.